Polished Brodie Van Wagenen talks a good game, but can he back it up? Mets' new GM speaks well but offers few specifics in his introductory news conference Tuesday at Citi Field. Day One of the Brodie Van Wagenen era in Flushing made for good TV. The Mets even had dozens of employees fill in the back rows of the Foxwoods Club, sort of like a studio audience, and they applauded the intros of the new GM as well as COO Jeff Wilpon, who sat beside him on the stage. As rah-rah speeches ago, BVW sounded effective. Maybe the Mets even sold a few season-ticket packages after his unveiling. But as far as gleaning any substance from the proceedings, or figuring out BVW’s strategy for reaching these magical places, that wasn’t happening. It’s early though. Sandy Alderson used a similar playbook when he was presented in the same room eight years ago, aside from the “win now” part. Alderson -- whom BVW referred to as an idol during his years at Stanford -- was saddled with a much different directive back then, pretty much a gut-renovation of the franchise. BVW and Wilpon, however, insisted this would not be a total reboot, only that the mistakes made during the past two years, despite a $150-million payroll, will be corrected. As for the investment in the 2019 club, Wilpon left that number as a cliffhanger for this upcoming hot stove season, saying, “We haven’t talked about a specific number yet.” Both he and BVW pledged to devote more resources to the Mets in every department, from on-field talent to scouting to analytics. There’s just one small detail to keep in mind. As much as BVW predicted the Mets would be in on every free agent -- Alderson wisely never made that promise -- he also was realistic about who buys the groceries. Despite BVW saying the Wilpons have granted him “full autonomy” -- Sandy hedged on that -- there is always a financial leash when it comes to ownership. “No GM or president of baseball operations has the ability to write the checks,” BVW said. Based on his cozy relationship with the younger Wilpon, however, BVW could be more persuasive in handing him the pen. The two actively discussed their bromance Tuesday, a bond forged in part on Wilpon’s giving a handful of his clients close to $200 million, and being friends definitely helped BVW nudge his way to the front of a pack that started with 40-plus candidates, according to Wilpon. Not sure how Mickey Callaway should feel about that statement, considering the manager came on board a year ago. But the Mets are breaking new ground by hiring BVW, who was one of the top agents in the sport a week ago, and it’s a sizable risk they had to sell the public on Tuesday. There’s nothing wrong with an “outside the box” candidate, and BVW, as we expected, handled every question like a routine pop-up. 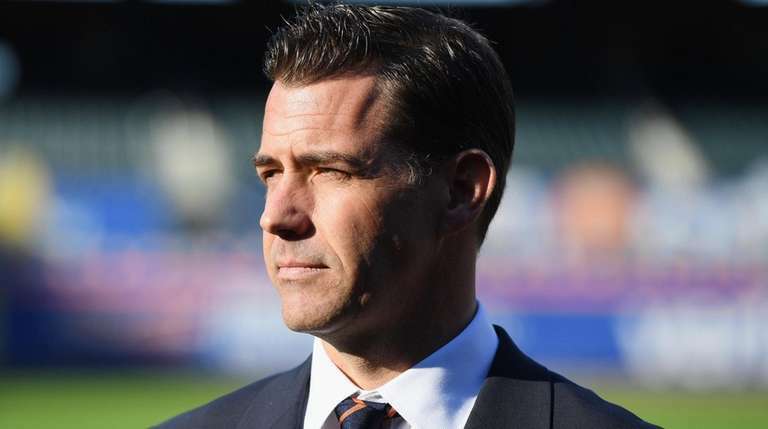 But as he and Wilpon talked about smoothing the waters with the Commissioner’s Office and Players’ Association -- along with divesting from his agency, CAA -- we wondered what lingering impact this radical move might have on BVW and the Mets. Will any of BVW’s former adversaries be OK doing business with him as a general manager? And what about the GM fraternity he’s joining? How is that transition going to go? We’ll get a better feel for the latter next week at the GM meetings in Carlsbad, California, when BVW’s new job crosses over from theoretical territory to the real thing. Tuesday’s event at Citi Field basically amounted to campaign promises. But it won’t be long before everyone will want to see concrete improvements, and the pressure’s on BVW to produce them right away. For a franchise that’s finished over .500 just twice in the past decade, creating a “culture of positivity” isn’t so easy to do. “He’s a winner,” Wilpon said. Now let’s see if he can turn the Mets into one.